On January 9th, this year, we were on our way home from Malaysia back to California. Denice, Duncan and I had spent 3 months in Miri with my parents. Doug had dropped us off in Malaysia in October the previous year and came again in January to fetch us home. Towards the end of the month, both kids kept saying they wanted to go back home to California. It wasn't just the kids, I too thought it was time to go home to California. One of the things I discovered during that stay in Malaysia, yes I was home, home with my parents and my siblings, but at the same time, it was not quite home anymore. When I got married and left my family I set out to make a new home with my husband and indeed we had slowly built a home to call our own. Our very own home, and two kids to fill that home with us. The kids went back to school after staying home for a week after our return from Malaysia. They were not quite over their jet lag, but they needed to return to routine and structure. 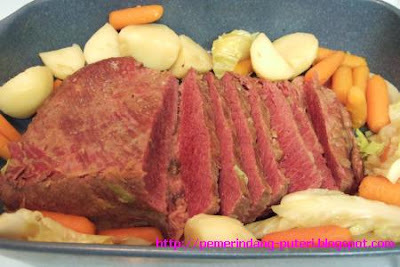 Corned beef cooked in guiness stout. 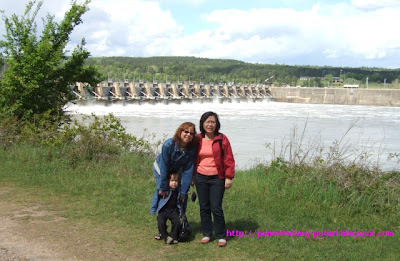 In mid April, my good friend, Esther, came to visit us. Her visit coincided with our planned trip to Arkansas, and we bought tickets for her so she could join us. We met at the airport in Phoenix, Arizona and then we flew on to Arkansas. We had a good time visiting Little Rock, Dardenelle and Russellville. The main purposes of the visit to Arkansas were to visit Doug's relatives, and to visit his 40 acres which he inherited from his mother. Other highlights in April were Doug celebrated his 51st birthday in April and we had a little barbecue with a few friends. 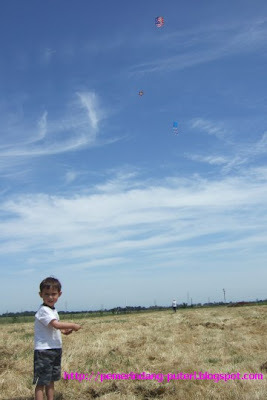 We also took the kids out to fly kites on Kite Day here in Galt. In June, we enjoyed the fruits of our gardening effort, or more accurately Doug's gardening efforts! We had fenced off the front porch area to keep the geese out and there was enough space in the front for some gardening. 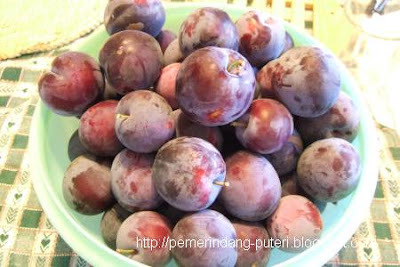 We had squash, tomatoes, corn, radish, water melon, cantaloupe, and the fruit from our fruit trees like plum, and pears. In July, I succumbed to the lure of income made from Google Ads placed on my blog and the lure of income made from writing paid posts. I have not quite made a $100 from Google, but I have definitely made more than $1K from writing paid posts. 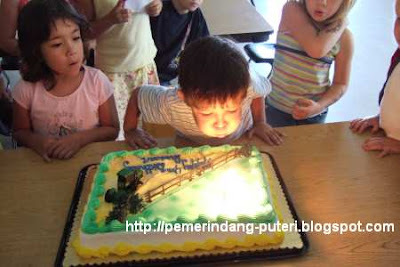 :-) Duncan celebrated his 4th birthday on July 20th. We continued to enjoy the fruits of our gardening effort. We had more cantaloupe and tomatoes than we could eat. On August 8th, Doug and I celebrated our eighth anniversary. Has it really been eight years? I also celebrated 2 years of blogging in August. August was also the harvesting season for the water melon that we planted in June. We had more than we could eat! 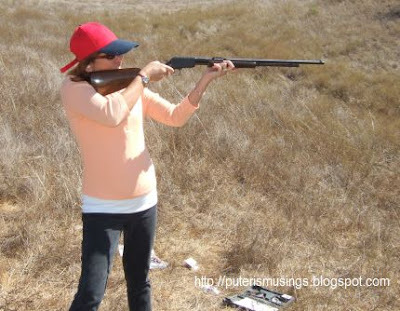 The highlight of September was our trip to Nipomo/Los Osos which included an afternoon of target shooting. We had some work done to our yard in preparation for growing grass. 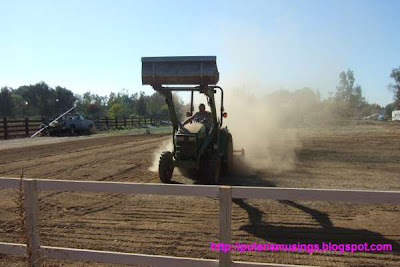 We were not able to do the sowing in the fall because by the time all the sprinkler heads were installed it was a little late in the season for sowing grass seeds. We'll have to wait for early spring. 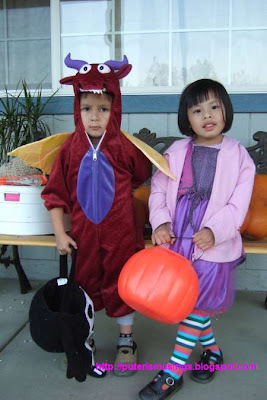 The kids had fun on Halloween night. Duncan got to ride a pony, and both kids rode on the Tea Cup carousel at our Church's Harvest Festival. It was Halloween but our Church called it Harvest Festival. 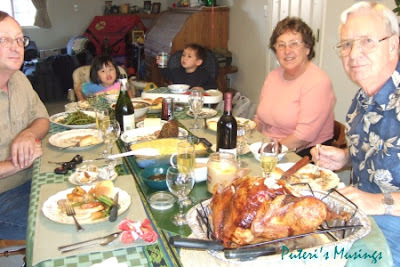 My in-laws came to spend Thanksgiving with us in November, and I roasted turkey using Jamie Oliver's recipe. Muaaahh! It came out perfect! No woman could have asked for better in-laws! In December, the day before my birthday, I decided to do a blood glucose reading an hour after dinner. The reading showed 211 mg/dl. A person with normal blood glucose would have a reading of under 160 mg/dl. That reading spooked me and I decided to take drastic action where my diet was concerned. With regards to my parents in Malaysia, I am happy to note that my father is managing his diabetes well, and that his problem with hypertension seemed to have completely gone. He had been taking hypertension medication since his late 30s and since his diabetes related illness, and hospitalization in December last year, his blood pressure seemed to have normalized. We took the kids to visit the home of a quilting friend who passed away in March. Her home had always been a big attraction at Christmas time with all the colorful Christmas lights and decorations. I was happy to see her family carry on the tradition, and her absence was keenly felt this year. One of the biggest highlights of the year, is the new friendships I have made through blogging. Blogging has become more than about sharing your thoughts, your life, or your rants, but it has become an enjoyable past time with the renewing of old friendships and the making of new ones.